Oil is high-molecular, heterogeneous liquid. Molecules are difficult focused with an atmospheric pressure and normal temperature. This energetically favorable balance of intermolecular and external forces is reached. This principle is based on oil cracking processing and oil products processing in a high-frequency hydrodynamic ultrasonic "USB" cavitator. Stream of oil products, passing through USB, gets to the cavitation zone. Frequency of following of impulses is caused by the geometrical USB parameters in the range from 400 to 35 000 Hz. All stream of oil passes through a zone of highly effective cavitation. At explosion of cavitational bubbles for very short time (less than 1 microsec) temperature reaches some thousand degrees Celsius and pressure more than 1000 atm develops. The equipment for mixing crude oil is designed and gets out for ensuring the minimum difference of pressure and the maximum reliability. Blending installations are equipped with the controller with unique self-training algorithm which instantly reacts to changes of process conditions or quality of raw materials. Components are continuously dosed, and their ratio is constantly regulated during production of party of a mix to provide optimum quality and the minimum losses. The mix is corrected by the volume of standard conditions. 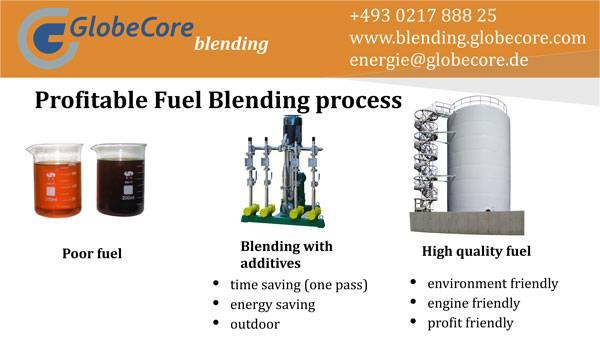 GlobeCore crude oil blending systems provides always good quality of all party, even during switching of account capacities, shortage of raw materials, loss of power supply. The ready-made product mixes up in the hydrodynamic ultrasonic mixer “USB” blending installation and provides constancy and accuracy of the installed analyzer. In the same place there is an ideal place for installation of an automatic probe for sampling.